Florida Probe Corporation announces the worldwide release of their Go-Probe System 2nd Generation. 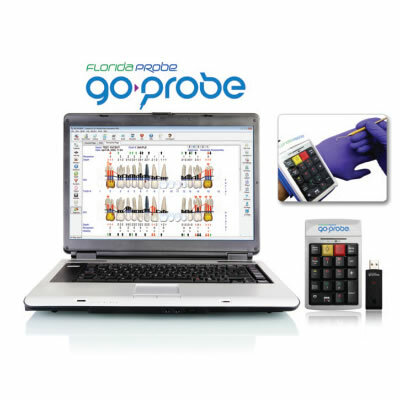 This periodontal charting system includes the Florida Probe (FP32) Version 9 Software and 2 Go-Probe Wireless Keypads to input exam data, while allowing you to use any periodontal probe. This economical, single-operator system bridges with more than 40 practice management software systems and increases case acceptance with pre-exam videos; talking software that engages the patient; picture-oriented, color-coded charts; post-exam handouts; and a personalized periodontal risk assessment screening.